Headshots in Red Dead Online work a little bit different than in the offline game. Not mechanically, but getting Red Dead Online headshots are a little trickier than you might be used to. This is mainly due to the fact that Dead Eye doesn’t slow down time online. Therefore, scoring headshots in RDR2 online is a bit more of a challenge. Luckily for you, there’s a simple method to make headshots; plus, there’s a setting that makes it easier. Our Red Dead Redemption 2 Online How to Get Headshots guide aims to help you score headshots in Red Dead Online. How to Get Headshots in Red Dead Online? To get headshots in Red Dead Online, you want to make liberal use of the autoaim feature. I don’t mean Dead Eye, which works different in Red Dead Online than it does in the base game. At the very least, it doesn’t slow down time in the online, so it doesn’t help as much with scoring a headshot. What I’m talking about is the good trusty ole aiming that you do by pressing L2 on PlayStation 4 or the left trigger on Xbox One. Now, there’s kind of a catch there. The “issue” here is that the aiming will automatically snap to the torso of the enemy you’re trying to kill. Now, that’s not that big of a deal in and off itself. However, if you’re trying to take care of people real fast, or just want to show off by getting headshots, then just the autoaim won’t be enough. So, you are going to have to do some course correction, as it were. So, when you lock on to a target, what you want is to flick the right stick up a bit to aim at the head. Don’t push too far, just give it a little flick up. Sure, it might require a little practice, but you’ll get it fairly quickly, I’m sure. 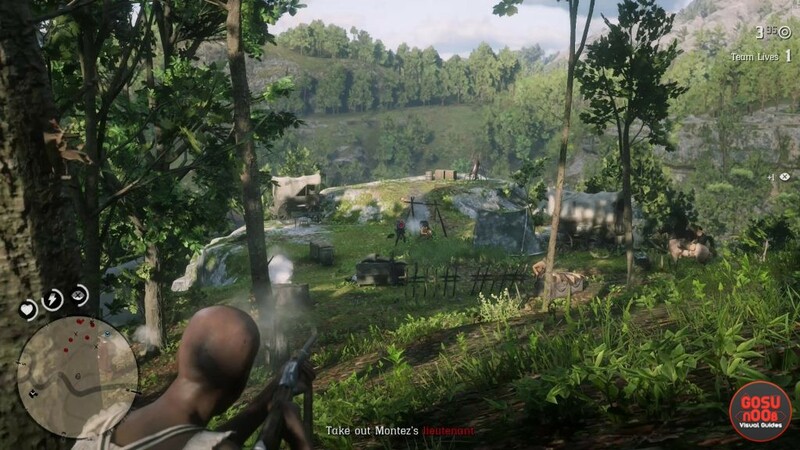 So, once more for the cheap seats in the back: to score headshots in Red Dead Online, use the aiming function on L2 or Left Trigger, then flick the right stick up to move the reticle to the head, then fire. It’s simple, and you’ll learn it pretty quickly, I’d wager. Now, there is something that you can do to make getting headshots in Red Dead online. That brings us to our next segment: how to make headshots easier. Red Dead Online Headshots – How to Make Easier? To make headshots easier in Red Dead online, we recommend that you change the lock-on setting to Wide. You can do this by first going into the Settings, then into Controls. Find the Lock-On option in the Targeting section, and switch it over to Wide. There’s a very good reason for this. Basically, there are three settings for the lock-on: Narrow, Normal, and Wide. You can think of these three settings as Hard, Normal, and Easy. Narrow shrinks the auto-aim, making aiming way more diffcult. Basically, what it does is decrease the window where the autolock will snap to the target. By contrast, setting the lock-on to Wide increases the window where the autolock will work. Now, don’t get me wrong, if you point the gun way off target and press autoaim, it won’t magically jump onto the enemy. You do still have to point the gun in the general direction of the enemy. That said, though, that increase in the autolock window makes quite the difference, especially if you have to react really quick. Plus, it gives you a little extra freedom to control where you’re aiming. That way, you can line up a headshot much more easily. Gives you more room to fiddle about, basically. That said, don’t hesitate too long; you do still have a potential bullet or ax heading your way. NEXT POSTRed Dead Online Robbing Trains – Is it Possible?